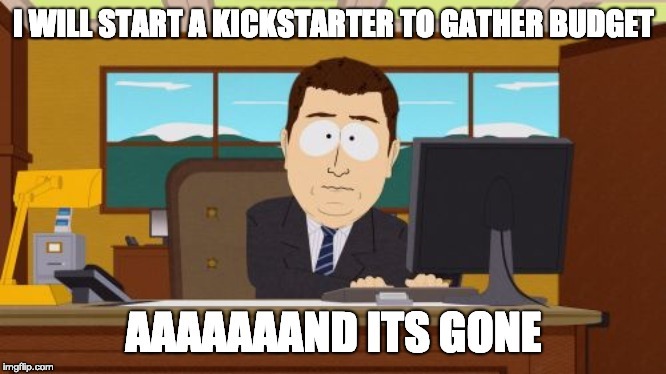 So I achieved my goals and the Kickstarter Campaign looks just horrible .... by today we have 11% funded and already 5 days gone. Even with the minimum funding reach by the end of it, it is not that what I expected and as you all know the first days should be the strongest to get the Campaign going. The goal is calculated with the very very very minimum and I will have to pay on top to get the game working and release it. What is the problem? What did I miss? As you can see in the numbers. Yeah, I was able to gain follower on every platform, but in total the community is still very small and not very meaningful. There was already the first indication that my game isn't that attractive to people, otherwise the numbers should have raised higher. Problem: I hadn't any comparison and was too busy spending time on developing the tech demo (which nobody wanted). By the way speaking of the tech demo, when I was releasing a first playable version I just had round about 15 Downloads and nearly no feedback at all. Slowly I got some bites of feedback and it told me, that those who downloaded the game didn't even know what to do, because they didn't played the original game. The tech demo was of course so early that there wasn't polishing possible to explain how the game actually works. Problem: I ignored the fact, that the playable version wasn't intuitive enough and not well received by my small community. I have had quite a lot of fun to create my video log diary and showcase my development status. Nevertheless I was always a bit shocked by looking at the video statistics after releasing a new video log. Nearly nobody watched it and the watch durations were really really short. Problem: I didn't see the signs of unattractive content at all. What can I do now, after realising the problems with the crowdfunding? If you get a little bit of distance to your game, which I got after 5 days of running Kickstarter and thinking about the situation, you start to realise, that I was too hyped for my own game and I didn't noticed that there wasn't a big interest from the community for my project at all. Now, I know that this campaign is as good as done and it won't develop very well anymore. The daily views are sinking with every day, I wasn't able to impress the press or YouTuber or Blogger to create a hype. So, I guess the campaign will slowly but surely end without gaining very much interest anymore and funding.